The software packs for MDK-Middleware and CMSIS already contain the *.SCVD files and the related event annotations in the C source code and provide project examples ready to run. Refer to the Using Event Recorder for detailed information on how to add event annotations to user code. Select Compiler:Event Recorder using the dialog Manage Run-Time Environment. Click on the documentation link in the dialog for more details. This adds the component class Compiler with the Event Recorder to the application and Project window. Configure the Event Recorder using the file EventRecorderConf.h. Number of Records EVENT_RECORD_COUNT Specify the number or records stored in the Event Record buffer. Each record is 16 bytes. Time Stamp Source EVENT_TIMESTAMP_SOURCE Specify the timer used as time base. Default is the DWT Cycle Counter that is part of the CoreSight debug interface. This counter is not available in Cortex-M0 and Cortex-M0+. Other options are SysTick and User Timers. Time Stamp Clock Frequency [Hz] EVENT_TIMESTAMP_FREQ If the DWT Cycle Counter is not used as timestamp source, then set the correct time stamp clock frequency here. Initialize the Event Recorder in the application code. If you are using Keil RTX5, you can enable and configure Event Recorder settings using the RTX_Config.h file. Refer to Event Recorder Configuration for more information. Refer to the Event Recorder documentation for details about adding event annotations to your code. Add or verify that a Component Viewer Description File is attached to the project. To preserve the configured Filter Component Levels, place the Event Recorder into a non-initalized memory area. 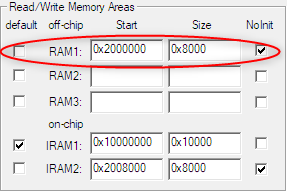 In Options for Target - Target, create a Read/Write Memory area and set the NoInit flag. Right-click the class Compiler in the Project window and open Options for Component Class 'Compiler', select Event Recorder, and Memory. Assign the defined memory area to Zero Initialized Data. µVISION DEBUGGER: Event Recorder shows "Error E202: Syntax error..."